Once the recommendations as per the pay panel are recommended it would cost the government's exchequer Rs 29,300 crore. The revised allowance structure as per the recommendations made by the 7th Pay Commission would be announced next week, sources have confirmed. The Empowered Committee of Secretaries (E-CoS) is looking into the recommendations following which it would be presented before the Union Cabinet next week, the source also said. 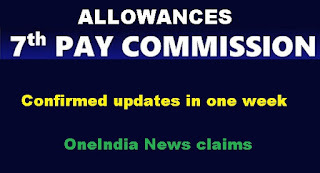 The 7th pay commission had proposed a total of 196 allowances; a Committee of Allowances was formed under the Finance Secretary Ashok Lavasa to screen them. The employees' union has been pressing for an update. A member of the union informed OneIndia that they are hopeful that the proposal regarding the allowances would be cleared by next week. Government sources informed that the E-CoS is looking into the recommendations on allowances made by the 7th Pay Commission. It would submit its report to the Union Cabinet following which the same would be cleared the source also confirmed. The recommendations made by the Ashok Lavasa-led review committee regarding allowance structure were to be tabled before the E-CoS after consideration by Department of Expenditure. The committee of secretaries will table the proposal for implementing the recommendations made by the 7th Pay Commission, complete with the suggestions from Committee of Allowances, will be presented before the Cabinet for approval. The E-CoS meet will be presided over by Cabinet Secretary P K Sinha. Officials from Home Affairs, Finance, Health and Family Welfare, Railways, Personnel and Training and Post will also take part in the meeting. Central government employees say that they are frustrated with the wait. However government sources say that their wait will not go futile and there would surely be an update by next week. The Seventh Pay Commission was constituted in February 2014 to review the principles and structure of emoluments of all central government civilian employees, including defence forces and submitted its report on November 19, 2015. Government employees have been saying that the meagre salary hike following the 7th CPC's recommendations undermined their self-worth. For them the hope is that the updates on allowances would be announced next week. Prime Minister Narendra Modi himself is keen that the the central government employees get a good deal. After submitting the report to Jaitley, Lavasa had said the committee has taken into account representations made by various stakeholders. The report will now be examined by the empowered committee of secretaries and following that it will be placed before the Cabinet, he said. Out of total 196 allowances, it had recommended abolition of 52 and subsuming of another 36 into larger existing ones. The Pay Commission had recommended increasing the HRA in the range of 8 per cent-24 per cent. The revised allowance structure as per the recommendations made by the 7th Pay Commission would be announced next week, sources have confirmed.